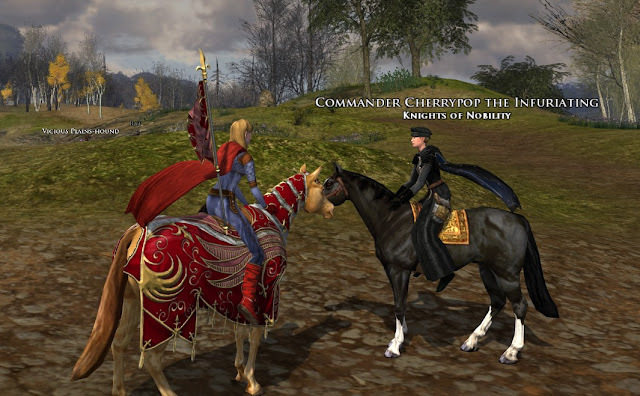 My most recent horse is the Steed of the Minstrel. What an interesting color and pattern he has! He shines as brightly as the Steed of Bright Days. hehe. Do you like the pretty pink pony? He certainly makes me smile. I am so happy that my Steed Gallery (All the Steeds) has come together even better than I expected! ...and very thankful to those who contributed to help make it better. As I write this column, I have photographed all but one: I am missing only the Horse of Many Colors (from the Tower of Orthanc). No one in Arkenstone has that one yet and I haven’t made contact with anyone off world who has it. I believe that there are a few of them in existence, so I am optimistic. Is there a reader out there who has one or knows someone who has one??? So, here I am on my own collection. 84 of 93 steeds… and I am hitting a wall. It is time to assess what I can and cannot do to achieve the other 9 steeds. I will look at what I think is Doable and what I think is Impossible for me to achieve. Your uberness might have different answers for you, but this is where the kryptonite hits the fan. (x) Wild Mountain Goat: Saviour of Lothlorien. I am so close on this one. 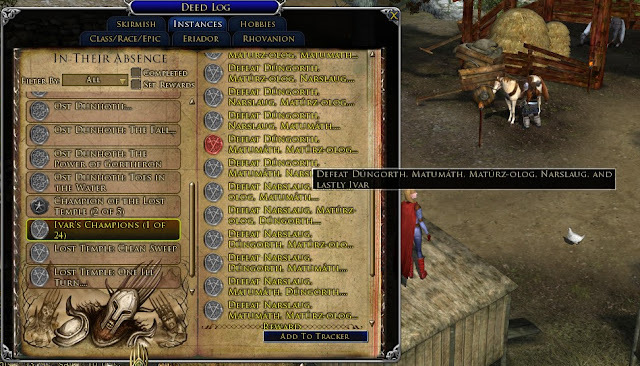 The Saviour of Lothlorien Deed is a 4-part meta deed to complete everything in Naladum (3-person), Lumulnar (3-person), Halls of Crafting (6-person), and Dar Narbugud (raid). The toughest sub-deed is 60 total trolls in DN for troll-slayer. There are only 10 trolls in DN. On double-slayer, only two more DN runs will do it for me. So, I can see the goat at the end of the tunnel. (x) Mahogany Bay: Moors Rank 9. This one is very doable. I don’t spend that much time in the Moors, but even a slow boat will get there eventually. I am Rank 8 and almost a half. At the rate I progress in the Moors, I am still a ways away. Throw in a major expansion in October, new quests, new deeds, new instances, festivals, other interests… I think I can get to Rank 9 by mebbe next April? Yeah… let’s pencil that one in and reassess later. Glee! That is exciting seeing a potential new obtainable steed on the horizon. Here is a shot of my friend Cherrypop, posing on the black Mahogany Bay horse for me. The best shot from this photo shoot is in the Gallery. (x) Galadhrim War-horse: Tempest of Dol Guldur. I know very little about the DG deed. The Tempest of Dol Guldur is a 4-part meta deed to complete everything in the Dungeons (3-person), Warg-pens (3-person), Sword-halls (3-person), and Dol Guldur (raid). I have been to the sword-halls and recently Nimitar took me to the Warg-pens, but missed the other two. Oddly enough, Dungeons and Dol Guldur are the ONLY two instances I have never visited in the game. I seem to have a mental block against the DG area. When I was growing up as a young pup in Celondim, DG was new and at the height of popularity. By the time, I got to DG, it was “very last season”. I did everything there was to solo in Mirkwood, still worked on past raids and Moria instances, and then moved on toward Enedwaith. I have compartmentalized DG “over there”, but hope to one day give it a go. It is doable, right? A steed is involved, so it must be good. Hey, this horse is available right now! All I have to do is have a level 75 loot-box, and a key, and extremely good fortune. Yep, more luck based winning. I have opened 11 loot-boxes thusfar, and have found no horses yet. That is a dark path to walk down, buying expensive loot-boxes and expensive keys from the AH in hopes of getting a horse. Not that I haven’t considered it; I just seem to shop when no one is selling. Well, I cannot roll back time to 2008 (reversing the rotation of the Earth is a movie myth, even Kal-El thought it was hokey while he has doing it in that movie). 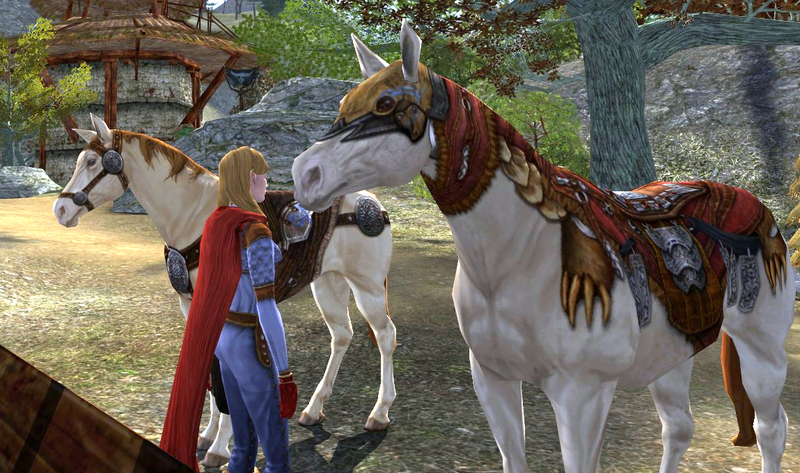 This horse has not been available in the lotro store yet. I think it is possible it might be someday, but there is nothing I can do to get this one since it is not available in any form. I actually hope that the Festive Azure does not make it to the store. This is the gift the old-timers received for being… old, and for having accounts still active since June-2007. I am fine not having them all (/eyetwitch). Breaking down the meta deed… In your presence is a 6-part meta deed: Mysterious relics (solo), Northcotton Farm (3-person), Stoneheight (3-person), Lost Temple (6-person), Sari-suma (6-person), Ost Dunhoth (raid). The first 5 parts, while difficult at times, are doable. The last one, Ost Dunhoth, is more difficult. What I learned recently though... "Ivar's Champions" is NOT part of the deed required to get the horse! That is a very good thing! It boils OD down to mostly just beating all wings on T2 Challenge. Ok, that isn't the easiest thing ever, but the deed “Ivar’s Champions” requires defeating Ivar and his champions 24 different ways! So, Ivar's deed, if you were really focused and had a dedicated group, you could get through it in a minimum of 24 weeks. But, not doing Ivar's Champions means that this Steed may move to the "Possible" list, because Eventually, I can envision mustering a group to go do OD T2. (x) Horse of Many Colors: The Armies of Isengard (the Tower of Orthanc). Here is the latest raid steed. The ToO meta deed is a 6-part deed: Thorn in the Hand (basic completion of the non-raid instances), Fangorn (3-person), Dargnakh (3-person), Pits of Isengard (3-person), Foundry (6-person), Tower of Orthanc (raid). Ok, Dana. This one is not impossible, but it doesn’t register on my radar either. Fangorn and Dargnakh deeds were glitched when I did them before Great River. I have recently gone back and completed those and still need to beat the Pits of Isengard T2 in its various forms. The Tower of Orthanc T2 is mortally tough. As far as I know, Arkenstone hasn’t seen anyone beat Saruman T2 on either non-challenge or challenge, but I’m not sure if anyone has tried in a long time (mebbe I will ask around again). There are certainly people in the world who have beaten T2 non-Challenge, including my three uber writer friends Lothirieth and Ravanel and Wynnie. Even fewer in the world have beaten T2 Challenge and are eligible for the steed. It will stay in the nearly impossible category, but who knows... mebbe I will be there when Arkenstone has a group clear ToO T2 challenge. (x) The Free People's Horse: Moors Rank 12. Yeah, that PvP12 steed is in the impossible/nearly impossible category for me. Looking at my progress as mentioned in the Mahogany Bay Horse above, best case scenario is that I am about 32 months away from The Free People’s Horse. Factor in actually enjoying the other aspects of the game, I can probably double that. So, five years from now, mebbe I can be at the currently unthinkable rank of 12. That is quite the extrapolation, isn’t it? Lol! Everyone has a 5-year plan when gaming, right? Check in with me on this one at the halfway mark in late-2015 and see if I am still on trajectory. 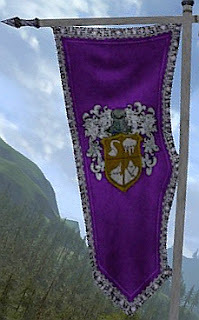 For fun, here is a closeup of the Free People's banner, as it flies on the back of Second Marshall Tharros's horse. I wish I could help you get some of those such as with the instances regarding the BG and OD cluster. BG and OD are a breeze now at 75. Darn servers!! I'm only missing Saruman T2 CM for the ToO horse.. but it's not happening for my group... have spent some really horrid nights there. :( Ah well, we'll get it at some point as our level increases. It's just a pity we couldn't get it done before the expansion as it's affected my alliance's morale. If only I had the willpower to level up a toon on your server. :P But alas timezones would likely get in the way anyway! Impressive horse count. Between Buchandor's and my 18 characters we only have 61 of the horses/goats. But I can say Kipton just recently won the Skeleton horse. Yay Asma/Kipton and your Skeleton Horse! :) Congratulations! Yay! Thanks for the feedback Aktaie! Whoah...grats on the collection! I certainly have nowhere near the number as you, especially since I'm mostly a solo player, and the only store-exclusives I'd ever have would be from lottery wins. I'm wondering what the whole War-steed system will do for higher-leveled players, in terms of what steed they will normally ride around town or anywhere other than Rohan. From experience in the beta, the War-steed has the speed advantage, though it isn't quite as responsive as pre-RoI steeds (being more realistic and all), so I might end up having two quickslots for my War-steed and "casual" steed I'd be riding. I'm also wondering what having a faster-than-168% steed out or Rohan will do in terms of being able to reach previvously-unreachable areas that we technically shouldn't be able to explore. I have not done much testing of that part in the beta (since there are more important things to test), but I might have to take a tour around Middle Earth come live and just see if the issue does indeed arise. Those are really interesting questions. 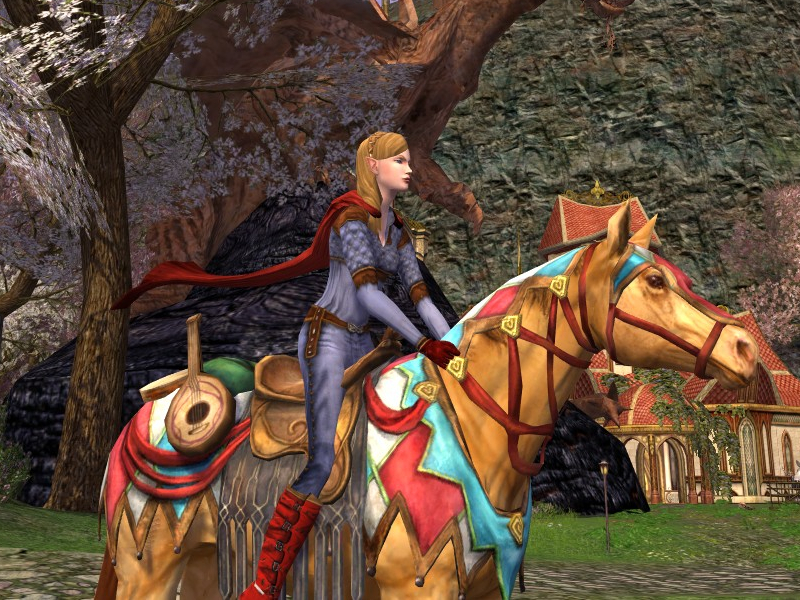 Right now I usually have 5 steeds up on the bar easily accessible (with the rest sitting in the corral, http://www.danania.net/2012/05/tonicbars-lotro-horse-corral.html). That does mean that I have "favorites" though. In Rohan, I expect to have 3 bridles (heavy, medium, light), so that would mean I have 3 war-steeds? I guess that is what that means. But, your point makes sense that if they don't maneuver as tightly as I need in town, I would probably keep a few "goto" non-warsteeds handy. As you said, there is is one quickslot for warsteed, regardless of type or bridle. I have limited myself to only a few non-warsteeds showing on the quick slots. I used to go horse riding in sydney and that sparked my love and passion for stallions. You tend to bond with both your online and real life horse. Very cool; I've ridden a few, but I don't have a horse of my own. Flying Warsteed: It's a bird! It's a plane! © 2012 Danania. Picture Window theme. Theme images by i-bob. Powered by Blogger.